A 2018 randomized controlled trial  compared placing a coronary artery stent to open up a severely clogged artery to a placebo procedure for stable angina, and found that the stent procedure made no difference to the outcomes and was potentially harmful. (Angina is typically chest pain or other symptoms due to clogged arteries in the heart.) In contrast, randomized controlled trials  have shown the Mediterranean diet reduced cardiac events by up to 70% and deaths by 56% in patients with heart disease; in similar head-to-head trials,  exercise has been better than stents for patients with heart disease. Medications, coronary artery stents, and surgery all have an important role to play in treating heart disease, and have contributed to a dramatic reduction in heart disease risk over the last 30 years. However, remember that our food and activity choices are likely even more important than the high-tech approaches for both preventing and treating heart disease. 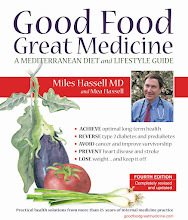 For information and references on using a whole food Mediterranean diet, weight management, and exercise to help keep our tickers ticking and trouble-free, see pages 59-92 in Good Food, Great Medicine, 3rd edition.